We’d love your help. Let us know what’s wrong with this preview of Stolen by Marlena Frank. In a kingdom known as the Garden, w It’s difficult taking care of a delusional father by yourself. Sixteen-year-old Shaleigh Mallet would rather explore and photograph dilapidated buildings than cater to her father’s dark episodes. But when she’s kidnapped by a creature who carries her atop a flying bicycle into another world, she realizes this wasn’t the escape she wanted. 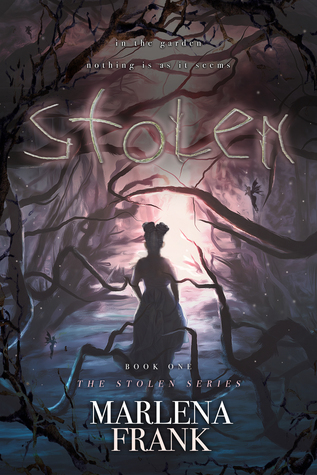 How did you come up with the idea for Stolen? Marlena Frank Stolen started out as a short story, written for a little prompt about spring way back when I was on Livejournal. I loved participating in writing…moreStolen started out as a short story, written for a little prompt about spring way back when I was on Livejournal. I loved participating in writing communities and writing challenges on there. The story started out with a girl running late for class and asking a talking stone lion for help navigating through the flower garden. Fast forward several years and several drafts later, and Stolen was born. Much inspiration was lifted from my love of Alice in Wonderland and similar portal fantasy tales like the Wizard of Oz. That idea of being swept away into another world and having to adapt quickly was really fascinating to me. Mix that with my love of 80s fantasy films growing up like Labyrinth, Return to Oz, and Neverending Story, and Stolen took on a much more interesting twist. It definitely shows my love of dark fantasy and my love of epic journeys like The Hobbit. All in all, quite a lot went into it over several years. Thank you for the wonderful question! First, I'll start by saying what a cool and unique book! I mean, you get stone lions, flying bicycles, and a world like no other. This story takes me back to the time when there were actually good fantasy movies: Return to Oz, Labyrinth, Legend. You know what? Probably just go ahead and make this one a movie to bring some creativity back to the world! Shaleigh was a very strong protagonist. I felt she didn't let getting sent to another strange world break her. In this new place, she grows as a ch First, I'll start by saying what a cool and unique book! I mean, you get stone lions, flying bicycles, and a world like no other. This story takes me back to the time when there were actually good fantasy movies: Return to Oz, Labyrinth, Legend. You know what? Probably just go ahead and make this one a movie to bring some creativity back to the world! Shaleigh was a very strong protagonist. I felt she didn't let getting sent to another strange world break her. In this new place, she grows as a character, figures herself out, and becomes a strong MC. Oh, and the side characters are equally amazing with distinct personalities to make them extremely fleshed out! Wow, I never had thought that a fantasy book will be so enjoyable. The characters, the places, everything was so magical. I can't wait for the next book. If I would have to choose one character I would choose Mawr. Thanks to the author for this ARC. I am incredibly lucky enough to know such great authors and be able to connect with them via social media. I mean, social media is great in this aspect...you know, if you ignore the comments on news articles. (Sometimes I don't, and it's a problem). This is how I won an advance copy of STOLEN by Marlena Frank. Well, not through a news article, but on FB during a launch party for publishing house sister. I'm rambling, so I'll get to it. Sixteen-year-old Shaleigh is the heroine of this story. She I am incredibly lucky enough to know such great authors and be able to connect with them via social media. I mean, social media is great in this aspect...you know, if you ignore the comments on news articles. (Sometimes I don't, and it's a problem). This is how I won an advance copy of STOLEN by Marlena Frank. Well, not through a news article, but on FB during a launch party for publishing house sister. I'm rambling, so I'll get to it. Sixteen-year-old Shaleigh is the heroine of this story. She loves photographing old buildings and landscapes and spends most of her time with her best friend and taking care of a mentally ill father. When she discovers a strange mark on her back, things begin to unravel. She is suddenly kidnapped and taken to a world unlike her own-to a place called the Garden. In this strange land, she comes to know it's inhabitants. From a stone lion named Mawr to a High Faerie named Teagan, she realizes that keeping allies close is just as important as keeping your enemies in the same proximity. This book is led by a PoC protagonist, but the amazing diversity doesn't stop there. What I loved is that each character is not identified by their race or sexual orientation, but by their strengths and heart. We also have mental illness play into the story. There are also other things that surprised me, but I won't ruin it. Let's just say I identify with a stone lion that has bad eyesight more than any fictional character ever. What a fantastic novel! I love the strange and magical vibe of the world, it’s like something out of an old 80s fantasy movie. Evil trees, faerie contracts, corrupt rulers, and living statues! Major Labyrinth vibes, but way darker and more political. Love the dialogue, especially the exchanges between Shaleigh and Teagan going back-and-forth about the messed up rules of the Garden. The cliffhanger at the end brings the story into to a whole new world of magic and terror and I am ready! I’m a fan What a fantastic novel! I love the strange and magical vibe of the world, it’s like something out of an old 80s fantasy movie. Evil trees, faerie contracts, corrupt rulers, and living statues! Major Labyrinth vibes, but way darker and more political. Love the dialogue, especially the exchanges between Shaleigh and Teagan going back-and-forth about the messed up rules of the Garden. The cliffhanger at the end brings the story into to a whole new world of magic and terror and I am ready! I’m a fan of loveable complicated characters and there are some phenomenal ones in this book. Morally gray Faeries (are there any other kind? ), a strong female of color MC, and a giant cowardly stone lion. I just want to put them all in my pocket and carry them around with me. Two more books right now, please! THIS WAS THE MOST UNIQUE, FASCINATING, BRILLIANT STORY!! The world building!!! It is so well written, enough detail that it paints a wonderful picture in the imagination, where you now start building upon it with your own interpretation!! Which to me is perfection! That is what i want from a book. This world where there are Faeries, Minotaurs, Shadow Wolves and Living Statues, etc. is so reminiscent to me of 80s movies that I loved, like Legend, Labyrinth & Return To OZ. BUT at the same time THIS WAS THE MOST UNIQUE, FASCINATING, BRILLIANT STORY!! The world building!!! It is so well written, enough detail that it paints a wonderful picture in the imagination, where you now start building upon it with your own interpretation!! Which to me is perfection! That is what i want from a book. This world where there are Faeries, Minotaurs, Shadow Wolves and Living Statues, etc. is so reminiscent to me of 80s movies that I loved, like Legend, Labyrinth & Return To OZ. BUT at the same time this one really stands on its own!! I would LOVE to see THIS on this big screen...whoa, that would be awesome!!! Stolen by Marlena Frank Spoiler Free Review. Wow, what an honestly refreshing and unique story! I loved how different and wonderful and fantastical the feeling of this book was. It was really a great read than I just had to award a 4 out of 5 stars to. Our lead character was a strong, wonderful character to read about and watch grow. In addition, seeing how her story grew, and watching her develop and evolve was really fanta Stolen by Marlena Frank Spoiler Free Review. I was sent the ARC for this book by the publisher in exchange for an honest review. The voice in this tale is strong and beautiful. From the first page, Shaleigh and her best friend leap off the page and pull readers into their visceral tale. I really connected with these characters and couldn't wait to find out what lurked in the abandoned building. 20% into this book, the story changed directions. Shaleigh gets abducted from her life and pulled into a new world. A I was sent the ARC for this book by the publisher in exchange for an honest review. 20% into this book, the story changed directions. Shaleigh gets abducted from her life and pulled into a new world. As a lover of fantasy I was super excited for this part, but something shifted the moment the main character woke up. The pacing was suddenly very rushed, and all connection to Shaleigh and her plight seemed to vanish. I lost connection with the character as stuff happened rather quick but she didn't really react to her surroundings or her life anymore. This novel is well constructed, beautifully written, and quite original. I really wanted to like it but I just couldn't get into the story. I wasn't able to connect to any of the characters. I just don't know why. Maybe it was the pacing? I think this book would please a lot of people but it just wasn't for me. Short version: I couldn't connect with the characters or the story. The blurb promised minotaurs, faeries, and reincarnation, but I didn't get that far. I stopped reading before the kidnapping occurred, because I didn't want to force myself to read something I wasn't enjoying. The dialogue didn't feel natural, and I had a hard time believing that's how people would interact with each other. And then there's all the stuff with her dad... Someone, likely and adult, should have stepped in and intervened on Shaleigh's behalf. The man believed his wife was alive and coming home, and even pretended like she'd never left when interacting with his peers. He refused to go to therapy or take medication, and would often sit in the dark and cry for hours or even days. His condition was known, yet no one did or said anything to help him or his daughter. Shaleigh knew how bad things would get, but she didn't push the issue either. Even though I only read a small portion of this book, I'm going to go out on a limb and say that I think something magical and unexplainable happened to one or both of her parents, and now she's dealing with the aftermath. However, no one knows magic is a possibility, so someone should have done more to help Shaleigh and her father. This turned out to be a very different story then I expected. I was expecting it to be like a changeling switch with a fae creature kind of story. What we got is an interesting adventure into a fairyland that had stone lions, fairies who drive flying bikes, and a land that is influenced by Queen Mab but not ruled by her. The first few chapters really set up the background for our main character Shaleigh who has a father who believes in Fae and suffers from some pretty strong disillusions about s This turned out to be a very different story then I expected. I was expecting it to be like a changeling switch with a fae creature kind of story. What we got is an interesting adventure into a fairyland that had stone lions, fairies who drive flying bikes, and a land that is influenced by Queen Mab but not ruled by her. The first few chapters really set up the background for our main character Shaleigh who has a father who believes in Fae and suffers from some pretty strong disillusions about seeing them in the real world. We also find out that her mother disappeared and I have a strong feeling we are going to find her in the next book but that mystery is not explored very much in the first book. Our main character likes to adventure into abandon houses and that how she is so easily “stolen” off to fairyland. I like that all the great elements from fae stories are included in this book. Fae contracts, evil trees, corrupt rulers, living statues, and what you think you know you really don’t. I think my favorite part of the book is when we meet Mawr the stone dragon he a very unique character that plays a huge role in various part of the stories. I felt really sad for him with him stuck in a destroyed library and an abandoned city. It was really cool to read about him getting his glasses and finding a place to teach and be a librarian of sorts again. They’re a lot to love in this story and the cliff hanger ending just when you think Shaleigh finally escaped and gotten back home although with a companion along for the ride you find that no it just the next part of the journey. A journey that takes us into the realm of Queen Mab oh joy I am enthused to see where this series goes. This book was amazing! The imagery the author is able to conjure up for the reader is fantastic because she does such a great job with the descriptions. While the story may have the feel of familiar elements (think Wizard of Oz), it is actually very unique in it's own rights. I recommend this book to anyone who loves a Wizard of Oz or Alice in Wonderland type feel to a story. I can't wait to see where the sequel takes the characters that I have grown fond of. Sign up for my newsletter to get access to cover reveals, excl A writer of both fantasy and horror, Marlena’s work is in a smattering of anthologies. Her stories lean toward weird horror, creature horror, and YA fantasy. She typically thinks up strange tales while sipping sweet tea at her Georgia home, listening to podcasts on her hour-long commute, or while reading a good book with her three cats.